EXTREMELY RARE in gem STAR! 1 of only 13. 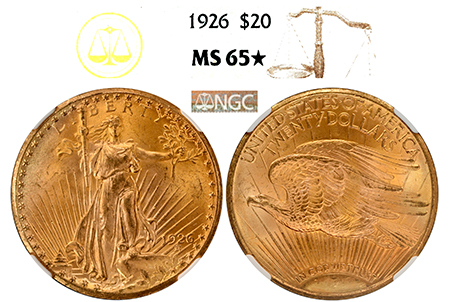 Many of the 1920s Saint-Gaudens double eagles were sent back to the mint and melted, making many issues rare today despite high original mintages. Saint-Gaudens were never heavily used in circulation. They were used more for international trade. Out of the 23,685 total examples graded by NGC in ALL grades, only 26 of those examples have earned a STAR designation. This gem stands out from the rest! Amazing gem golden surfaces shimmer and shine! Full details and spot-free surfaces offer mega eye-appeal and quality. NGC has only certified 13 examples in MS 65 STAR.